The pile of presents to wrap is growing and the Christmas cards I ordered have arrived, but I have yet to write the Christmas letter. I’ve attended three Christmas get together this week, and my refrigerator is looking pretty empty because I’ve yet to get the grocery store this week. It seems like the more I check off of my list, the more I have to do! 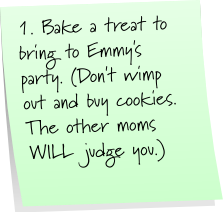 How are you doing on YOUR “to-do list” this month? 15 Responses to Are We Overwhelmed Yet? For the past two years, I purposfully have not scheduled anything during the two weeks leading up to Christmas otherwise I just.can.not.hack.it. So this year, I'm actually doing pretty well. I have one gift left … his is always a hard one. Ginny, you are not alone. I just sent out my cards and just now ordered my husband's gift online. Here's hoping it arrives in time. The one thing on my list I've decided to ignore? Dusting. Hate doing it and even though I hate seeing it, just can't get to it and I'm not going to worry about it. I have presents to wrap. Enjoy your holiday! Oh girl! I am right there with you! Just ordered, yes I said ordered, the cards. Did half of the grocery shopping, we have guests coming to stay for a week…a week! 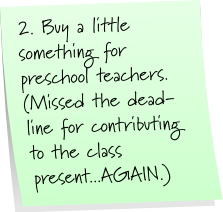 Have about 6 presents left to grab, and then teacher and therapists gifts (6). So still a ton left. But my wrapping is done! I love doing that so I get it done as I go along. 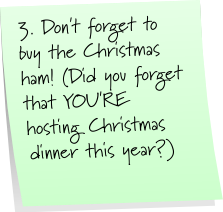 The very first thing on my list is: make a to-do list for all the stuff you need to do before Christmas without going all barmy and mad! I'm doing terrible on my to do list, I'm blogging and blog reading instead! I am getting there, very slowly, one day at a time. Yes I am overwhelmed! My to do list is a mile long and here I am sitting on the computer because I am overwhelmed! I feel your pain… Christmas time is way too busy!